It was a day he knew was inevitable. As he sat on the podium flanked by one of his friends and ex-footballer, Dominic Oruma, and chairman of the Lagos Sports Writers Association (Swan) in Lagos, Fred Edoreh. It was time to formally announce the end of a two-decade marriage with Nigeria's top-flight. 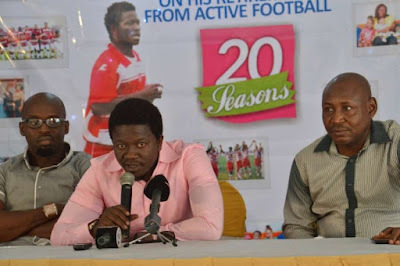 With a dignified and formal look in his face after the orator had reeled out his achievements while playing in the Nigeria Professional Football League (NPFL) for 20 years, Victor Ezeji took a deep breath after he was handed the microphone and his opening words were: "I am thankful to all the coaches, players and clubs I have played with. It's been an amazing moment for me." Ezeji's opening comment typified that of a man who is satisfied and left with no big regrets having played for Eagle Cement (now Dolphins), Sharks, Enyimba, Sunshine Stars, Dolphins and Heartland. It also showed that he was ready to call time on a career that has seen him win the NPFL, FA Cup and Caf Champions League titles as well as several individual awards. Plucked from the street in the mid-1990s to join Sharks where he earned N5 000 ($227 at that time), Ezeji was quick to settle down at the Blue Angels despite the presence of big hitters like Mbwas Mangut, Maskavin Tali, Chidi Aluka, David Doe and Kennedy Boboye. Ezeji had the chance to make his debut in the 1996 season at Jasper United, where he played all 90 minutes and his impressive display helped the Blue Angels claim a 1-0 victory through Tali's goal. "I still remember that day in Oba, near Onitsha, where I played my first game," he told supersport.com. "Of course, for a youngster I was excited and at the same time on the edge, but once the game started I just played as if I was in the street playing with my mates." After that first game, Ezeji never looked back as he went on to later play for Eagle Cement FC (now Dolphins), Enyimba, Sunshine Stars and Heartland. In between, he had a brief stint at Tunisian side Club Africain. Ezeji explained why he could not make a move to Europe. A chance to join Ajax Amsterdam from Ajax Cape Town ended due to injury. Then another chance to sign for Viborg FF was scuppered by Enyimba who blocked the move. "The Ajax chance was quite painful but I don't dwell on it anymore. I had the chance to join Danish side Viborg FF. It didn't happen because Enyimba at the time asked for $100 000 and Viborg were ready to pay an additional $50 000. Somehow they turned it down, telling me the governor (of Abia State) at the time did not want me to leave Enyimba," Ezeji explained. Apart from that sour memory, Ezeji had loads of other memorable moments in his career. Some of them funny, others like a myth and a few of them dreadful. "I will say winning the Caf Champions League comes top among them, then there were really crazy moments like when one of the coaches told us to leave cubes of sugar in our boots to help us score goals. I didn't partake in it because I don't believe in using juju or charms. The FA Cup wins with Dolphins were also special and winning the league title too. I also remember when I scored four goals in a league game, only to watch from the bench (while with Sunshine Stars) when another player (Christian Pyagbara) scored four in a game, and within few days another (Emem Eduok) scored six in a game in same year (2014)," he said. 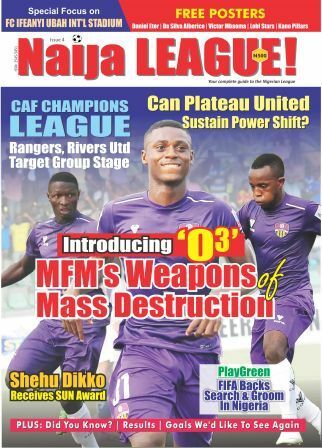 Now that the klieg light on his playing career is off, Ezeji said he has begun to champion a course for players in the Nigerian league - focusing on insuring their lives. “There are no law that states that I cannot be a coach, scout or an analyst after my career. However, my target is to help insure players on the local scene. I’ve already started talking with players about this and how to help them have something to fall back on when injured or disabled as a result of playing,” he said. Ezeji explained that he has decided to go into player's insurance considering the numerous stories of stars in the league who have been left with disability even at a premature age in their careers. The former Nigerian international said he is thankful that his career has ended without any kind of injury compared to players who were unfortunate. “When I look back, I realise I didn't suffer career-threatening injuries like some players do, and at times are unlucky to end their careers in such circumstance. My limbs and ligaments are intact and I could have decided to continue playing but I know this can't go on forever. So I thought about helping those still playing in the league to secure their lives in the event of such career or life-threatening injuries," he said. Just as he is thankful for a professional career of 20 years without injuries, Ezeji is grateful to a long list of individuals who contributed on and off the pitch. "There are lots of people who influenced my career positively and helped me become the player I was. Barrister Chris Green is one of them as well as Chief Adokiye Amiesimaka. I can't forget the advice of Emeka Enyadike either. The list is so long," he said. This article was initially published by supersport.com on February 13, 2016 when Ezeji announced his retirement, in Lagos.